I'm sharing one of the fun projects we made last night @ our Diva Night gathering. It's always lots of fun getting together to stamp, laugh, talk & just have a good time!! This card was one of my favorites so I had to share it with you....I think it's just fun and the colors are great together! My box of goodies showed up late yesterday evening just when I was getting ready to leave!!! I stopped everything just to unpack it and oogle for a moment before *running* out the door! I'm in the process of working on a few things that I'll be sharing with you over the next few days or should I say weeks before I leave for Utah! I'm getting excited thinking about all the fun we're going to have and the new peeps I'm going to meet!! Well, I better get back to work! Thanks so much for stopping by and have a great rest of the day! AHHHHH! Those trees are TOO CUTE. LOVE how you did the little flower accent. Love, love, love the patterns here! Terrific Jackie! I've got to make one of these cards. They are just sooo cute!!! This is so cool!! I love the round card and this new set. Beautiful job, Jackie! Very cute card! Love the round ones - something I need to experiment with myself! Thanks for the inspiration! 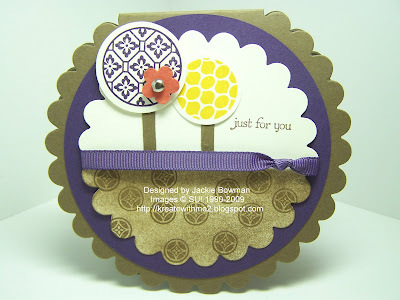 This is adorable Jackie, love the circle, and the designs used for this. Love this cute card, Jackie!! What a clever design!! Love this one, Jackie. I like the circle shape--both in the trees and overall card. This is awesome Jackie! Can't wait to see what you make will all your new stuff! This is lovely. Can't wait to see what you do with your new stuff. Love the round card! It's a technique that's on my list to try...thanks for the inspiration! This is AWESOME, Jackie!!! I love the round design and the super cool stamps!!! Love all the pretty colors, too!!! What an adorable card! I love the little trees! You are so creative! very cute! Good luck at open house!